The Ultra Aire Dehumidifier is manufactured by the Therma-Stor company of Madison, Wisconsin. The company has been in business since 1977 and its first products were heat recovery water heaters. Therma-Stor is better known perhaps for its Santa Fe range of basement and crawl space units which are renowned for their high quality, reliability and energy efficiency. 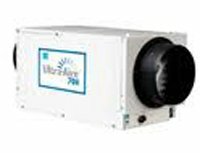 Ultra Aire whole house dehumidifiers maintain these standards of high build quality and energy efficiency and are among the best available in their class. The 65H is the lowest capacity unit in the range. This Ultra Aire dehumidifier is designed for smaller homes and will control relative humidity throughout an area of up to 1600 square feet. The advantages of the 65H are its energy efficiency, ability to operate in low temperatures and its compact, space saving design. The disadvantage is the high purchase price but this should be offset against its greater effectiveness, compared with one or more portable units, its lower running cost and its longer working life time. The 65H has now been replaced in production by the newest Ultra Aire Dehumidifier, the 70H (see below for details). The 70H is a new model from Ultra Aire which replaces, and improves upon, the 65H. The 70H has an improved water collection rate which allows it to operate effectively in a slightly larger home, up to 1800 square feet. Other improvements include enhanced energy efficiency and more flexible ducting arrangements to allow your 70H to be located in the most convenient spot in your home even if space is restricted. An added bonus is that the 70H runs more quietly than the previous model. With the 70H Therma-Stor have made an excellent dehumidifier even better and the 70H is undoubtedly one of the best models for an apartment or small house available in the USA. The 90H is a considerably more powerful whole house unit with a 90 pints per day extraction rate and the capacity to control moisture throughout a home of up to 2200 square feet. This unit is exceptionally energy efficient with an "Energy Factor" of 2.50 litres per kilowatt hour, nearly 40% better than the largest portable models. It can also used to improve ventilation in your home at times when moisture removal is not needed. The100V is a little different from the other whole house models in the Ultra Aire range. Although mechanically similar the components are arranged differently in order that the 100V is tall and thin rather than sharing the short, squat profile of the other units. This allows the 100V to be installed in spaces unsuitable for the other models or more convenient for you. The 100V possesses all the advantages of the other units and is suitable for a home with a total area not exceeding 2500 square feet. The XT150H is the most powerful unit in the range. This Ultra Aire dehumidifier is capable of removing 150 pints of moisture per day from your home and will deal comfortably with humidity control throughout a larger house with a total area of up to 3500 square feet. Despite its power the XT150H is relatively small and can easily be installed in a confined area such as your attic or crawl space. The XT150H is very energy efficient and boasts an "Energy Factor" of a massive 3.74 litres per kilowatt hour.